Ansonia "LA HONLAN" Royal Bonn China Clock , circa 1900 Ansonia Royal Bonn in excellent condition. 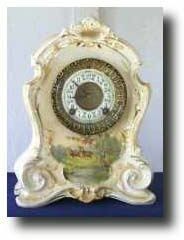 Case: Marked Royal Bonn, 10.5" tall Works: Marked - Ansonia Clock Co. New York, USA. 8 day time and strike on gong. Reference: Ansonia clocks by Tran Duy Ly Condition: Case - Excellent. Works - Excellent.